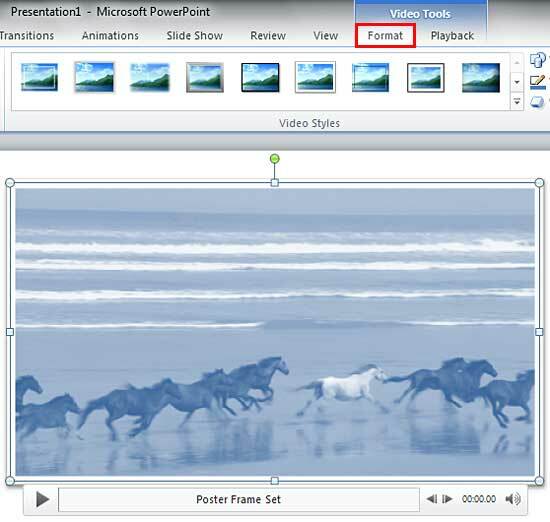 Learn how to reset your video clips in PowerPoint 2010. Note: Once you apply compression to a resized clip, you will thereafter find that the Reset options can only reset the appearance of the video. Open your presentation, and navigate to the required slide where you have already inserted a video clip. If your video clip is not already customized, go ahead and apply some customization -- the video clip that you see within Figure 1, below has been recolored, has a video style applied, and has also been flipped. Also notice that our video clip has a Poster Frame applied (indicated in the Player Control bar, highlighted in red within Figure 1, above). If your video clip doesn't have a Poster Frame added, go ahead and add one now -- this is entirely optional. With your video clip selected, you will see the two contextual Video Tools tabs in the Ribbon. These two tabs are Format and Playback -- click the Format tab to activate it, as shown in Figure 2 (highlighted in red). Within the Video Tools Format tab, locate the Adjust group and click the downward arrow on the bottom of the Reset Design button to access the Reset Design drop-down gallery that you can see in Figure 3, below. Reset Design: Select this option to undo all edits such as corrections, recoloring, etc. This will not reset the video if it is resized, rotated, or flipped. Reset Design & Size: Choosing this option will reset the the video clip completely, even all the resized, rotated, or flipped changes. Note: When any of the Reset Design options are used, the inserted video is reset to exactly the state it was when inserted for the first time. The only exception though is that any Poster Frame you added will not be removed -- to remove the Poster Frame, you need to use a separate Reset option for Poster Frames, as explained in our Poster Frames for Videos in PowerPoint 2010 tutorial. Make sure you save your presentation option.